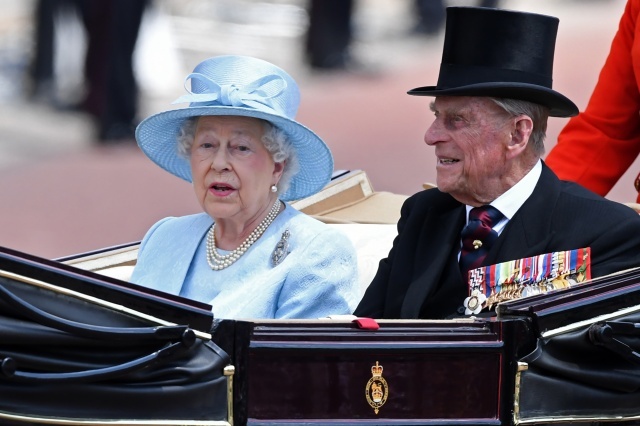 FILES) This file photo taken on June 17, 2017 shows Britain's Queen Elizabeth II and Britain's Prince Philip, Duke of Edinburgh (R) travel in a horse-drawn carriage back to Buckingham Palace after attending 'Trooping the Colour' on Horse Guards Parade to mark the Queen's official birthday, in London on June 17, 2017. Britain's Queen Elizabeth II, who at 91 has been on the throne for a record 65 years, is the world's oldest leader. She became queen in 1952 at the age of 25 following the death of her father, George VI. (AFP) - Zimbabwe's Robert Mugabe, 93, was until his resignation on Tuesday the oldest serving head of state in the world. He leaves behind around a dozen world leaders who are in power in their eighties and nineties. Britain's Queen Elizabeth II, who at 91 has been on the throne for a record 65 years, on Tuesday became the world's oldest leader. She became queen in 1952 at the age of 25 following the death of her father, George VI. Tunisian President Beji Caid Essebsi, 90, became his country's first democratically elected head of state in late 2014, four years after the revolution which unleashed the Arab Spring. In Cameroon President Paul Biya, 84, has been in power since 1982, having been reelected for a sixth seven-year term in 2011. Algerian President Abdelaziz Bouteflika, 80, has been in power since 1999, and was reelected for a fourth term in 2014. Weakened by the after-effects of a 2013 stroke which seriously affected his speech and his mobility, speculation swirls over his state of health. Sheikh Sabah al-Ahmad al-Sabah, 88, became the emir of Kuwait in January 2006. The half brother of the late emir Sheikh Jaber al-Ahmad al-Sabah, he became de facto leader of the rich oil emirate several years earlier, due to his predecessor’s health problems. Japanese Emperor Akihito, 83, acceded to the throne in 1989. In June 2017 the Japanese parliament paved the way for him to abdicate in favour of his eldest son after he expressed fears that he can no longer carry out his duties due to his age. In Saudi Arabia, King Salman, 81, took over the reins of power on January 23, 2015, after the death of his half-brother Abdullah. He has gradually handed over power to his son, Prince Mohammed bin Salman, 32, who became crown prince in June 2017. Norwegian King Harald V, 80, came to the throne in 1991. In Cuba President Raul Castro, 86, inherited power from his ailing brother, Fidel, in 2006, officially becoming president in 2008. He has announced that he will step down in February, 2018, to hand over to the new generation. Pope Francis, 80, elected the first Jesuit and Latin American pontiff in March 2013, is the Vatican's head of state. In Laos President Boungnang Vorachit, 80, has been ruler of this small communist country wedged between China and Thailand since 2016.